The ECBC Javelin Backpack is loaded with all of the features any traveler could ever want and need. From endless storage, to convenient pockets, unique water bottle holders, and a TSA approved slot for your laptop, this pack truly has it all. 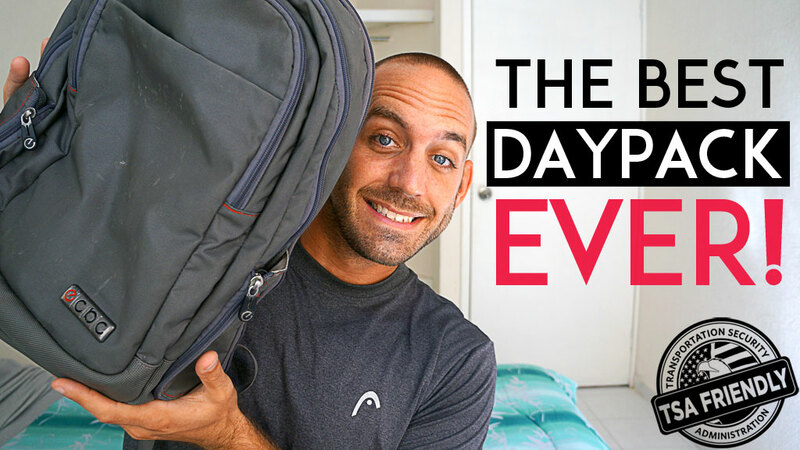 In today’s episode, I’m going to be telling you why I think the ECBC Javelin backpack is the best daypack ever! I’ve been dragging my Javelin around the world with me for the last couple years now and it’s the best backpack I’ve owned to date. Looking for pockets to store all of your gear, laptops, tablets, sunglasses, headphones, and so on? No problem! With three main compartments and over eleven different pockets that vary in size, the ECBC Javelin packs a huge punch all while keeping its incredibly slim look and design. The combination of the ballistic nylon and the water resistance proves to be everything I need to keep my gear safe when I’m on the road. I’ve dragged this pack through the rain, snow and the extreme heat and it has yet to fail me. Okay, so we all know what it’s like to have to pull out our laptops each time you go through TSA security at the airport, right? Well, according to ECBC, you no longer have to take your laptop out of your bag when passing through airport security. All you need to do is unzip the FastPass compartment, lay it flat on the belt and send it through the x-ray machine. Note: I actually used this feature when passing through security at LAX last year and there was absolutely no issue. I will say that you might have issues with other TSA agents that are either one, not in a good mood, or two just have no idea what this bag is about and the features that it offers. So, be warned that if you do decide to use the fastpass compartment, you still might get searched. At the end of the day, if you’re on the hunt for a new daypack for your next big trip, the ECBC Javelin is your best bet. If you’re interested in learning more about the ECBC Javelin, CLICK HERE. Thanks again for tuning in to this ECBC Javelin Video Review, be sure to SUBSCRIBE to my channel and as always if you have any travel related questions, please feel free to leave a comment below. This backpack looks awesome! Thanks for the info Ryan. I’ll share it around. Hey Amin. You’ve got mail, my friend!